As you can tell, my mind has already moved on to cooler fall weather. The palette, the tweed, the warm and cozy. 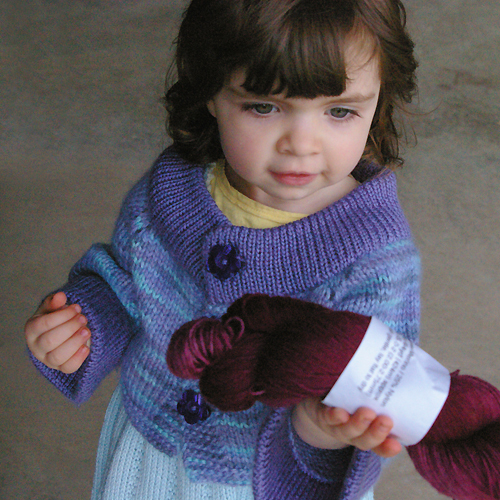 As for most knitters I suppose, the prospect of fall gets me re-energized to use the knitting skill for what it’s best known for – warm and cozy handmade clothes. The line up includes the ready to be seamed “Serendipity Stripes” baby sweater (a design I’m still working on), my “Golden Tapestry” cowl which is still humming along, and a new project – the “Berry Breiwick Beret“. The beret makes me smile. Lil One picked this hat out when she saw a sample knit of it at the CT Sheep & Wool Festival at the Dirty Water DyeWorks booth. “You knit for me?!? !” , eyes wide with amazement. She was so cute about it. Somehow, even at two years of age, she really appreciates the notion that I make things just for her. She loves hats, and she cooed and caressed the raspberry colored skein of yarn, and that was that. Mamma bought yarn and pattern then and there. So here I am knitting her a cute little fall hat! I really like the pattern by Gudrun Johnston, and it includes a really nice photo tutorial of the special cast-on used. The Dirty Water DyeWorks yarn is just “ok”. After just finishing a project with the saturated-to-the-core Sundara Yarn, I am a little peeved at the white that keeps popping through as the yarn twists and turns. Somehow it just seems like the color isn’t through and through on this yarn. The Interweave Knits I am not lovin’ this time. It’s not bad, but strangely it seems dated – as in 1970’s. I guess it’s the colors maybe. I did like the Bryn Mawr skirt shown in the picture, but I’m not sure how this would work in reality. I have some concerns about putting that thick of a yarn anywhere near my hips. I think it’s the belt that makes it work. Anyone know where to get nice belts like that? 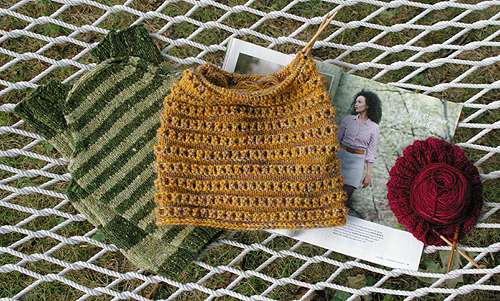 Hope you’re enjoying the summer and looking forward to fall knitting too! Your knitting is just beautiful and how talented to be able to create patterns. I’m with you about the Fall Interweave Knits. The only pattern I can see myself making is the Turque. When the serendipity stripes pattern is finished do you think you will be selling the patten on ravelry or somewhere? Absolutely! I have a ravelry store where I go by “colourknits”. You’ll see a blog post as it gets tested and then launched. Thanks for the interest!